Vice President Mike Pence is leading the U.S. delegation to the 2018 Winter Olympics. Vice President Mike Pence and his wife, Karen, will lead the U.S. delegation to the 2018 Winter Olympics in South Korea, the White House announced Wednesday. 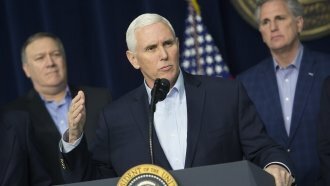 During the trip, Pence will also visit Alaska to review intercontinental ballistic missile defense facilities and make a stop in Japan for bilateral meetings. The vice president's office says the move has a dual purpose: to show support for U.S. athletes and to send a message to North Korea amid recent nuclear tensions. "The vice president is traveling to the Olympic Games in South Korea to reinforce the strong U.S. presence on the Korean Peninsula and send a clear message of American resolve to the North Korean regime," said Jarrod Agen, Pence's deputy chief of staff. "The Vice President will reaffirm to the leaders of Japan and South Korea the United States' unwavering commitment to our allies and to deter and defend against the North Korean threat. In addition to showing support for our U.S. athletes, the vice president will show his confidence in and appreciation for our U.S. military stationed in the region." In past years, public figures like Secretary of State John Kerry and first ladies Michelle Obama, Laura Bush and Hillary Clinton have led the presidential delegations to Olympic opening ceremonies. The Winter Olympics will be in Pyeongchang between Feb. 9 and Feb. 25.